Happy Friday friends! What a crazy week of preparing for our trip next week. I've got the beach on my mind and it looks like it translates into what I'm loving right now. I honestly cannot believe our big family trip is just next week! We had been planning this in our minds for a long time, (since January! ), and it took us a while to actually book the whole thing. But that was just a month ago and now that it's here, I feel like I need more time to prepare and just enjoy the anticipation. So funny, right? I've been wanting to go on a warm getaway for so long and now that it's just a week away, I'm wanting more time before we depart. I'm nuts, I know. I'm sure I'll get over it when I'm soaking up the sun at the pool. I've got a few more things to get before I feel like we're all ready for this trip. If you follow along on my IG Stories, you know that I was freaking out a bit about not having a bathing suit for Cora. Well, don't worry. My crazy unnecessary freak-out has been resolved since we picked one up at Target. And I got news that the one Cora really likes is coming in by Tuesday, so all is good in the bathing suit department now. 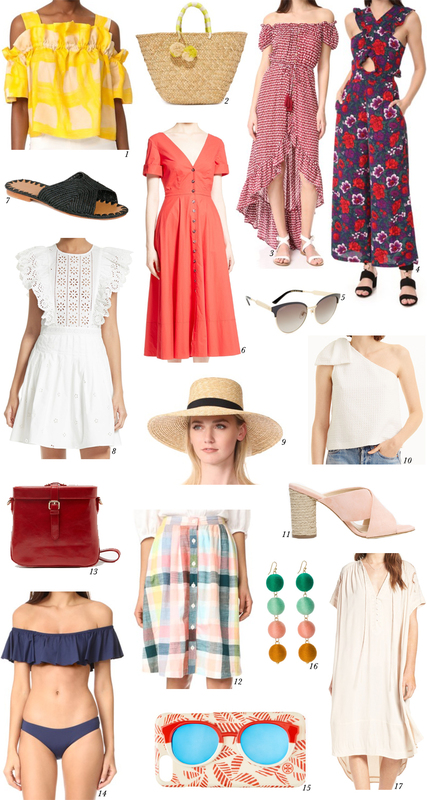 Let's get back to this beachy/boho/retro roundup. I realize there's a lot of different styles going on, but I'm loving it all right now. I'm really into things that have a retro vibe to it, like what I was talking about in my previous post and getting inspired by the movie To Catch A Thief. I'm also still into all things ruffly and thank goodness because it's everywhere! And how cute are those Pom Bon Earrings? I stumbled on them via Instagram and I am so glad I did, because I want all of the different color variations The Loveliest offers! Okay, time to get some lunch! And lots more errands too! Hope you guys have a wonderful weekend! But he then made an ace. "I don't blame the ball boy. I am not mad at him. I hope he doesn't have a sleepless night"(Image: Action Images via Reuters)BBC analyst ggg shirt Tim Henman said: "It's unfortunate that it's happened. Inhale the steam for 10 minutes. You can use this treatment two to four times per day.Adding a few drops of essential oil to the water is a good way to further decongest your sinuses and get the benefits of aromatherapy. Try peppermint oil to help relieve sinus headaches. Eucalyptus oil helps relieve nasal congestion. Do not use tea tree oil, as it is toxic when consumed.Consider oil pulling. Oil pulling is an Ayurvedic remedy that uses oil to remove germs and bacteria from your mouth. Most microorganisms adhere to the fat in oil, allowing you to spit them out along canelo alvarez shirt with the markiplier shirts oil.Use coconut oil.